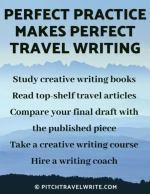 I’m often asked what’s the difference between a good travel writer and a great travel writer. To me, a great travel writer’s stories resonate deeply with a reader. You know those stories. They paint a memorable picture of a person or place that lingers in your mind well after you’ve finished reading the piece. Sometimes you enjoy the story and occasionally you’re rankled by it, but you certainly remember it! The best travel stories portray iconic and sometimes mundane events that encapsulate a person, a culture, or a neighborhood. They give us a better insight into people or a city or a country. To achieve these unforgettable effects, top travel writers seek out the deeper experiences that make their stories more authentic. And that’s what separates the best travel writers from run-of-the-mill writers. Well, where do you find out about these deeper travel experiences that make such good copy for travel magazines? You need go no further than the excellent new (2014) National Geographic Society publication, Where the Locals Go. If you’ve ever wanted a book that summarizes the unique cultures, customs, and celebrations of people around the world, Where the Locals Go is an excellent reference, and a treasure trove of story ideas. 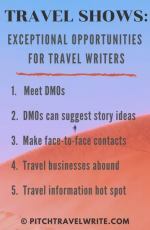 This book will help travel writers research and pitch unique and authentic story ideas. Where the Locals Go is a glossy, well-written and beautifully illustrated compendium of the indigenous eccentricities (wow!) of people and countries around the globe. In other words, it reveals the funky stuff worth writing about. From Portland, Oregon’s craft brewpubs to Oaxaca’s colorful shopping markets, and from Jamaica’s aroma-packed Jerk Joints to the heavenly sounds of the evensong choir in Cambridge’s King’s College, you’ll get dozens of fresh story ideas about more than 300 interesting places around the world. Certainly some of the book’s 300 festivals, markets and events are stereotypical of their countries. Where the Locals Go invites you to join in Highland fling lessons at the Scottish country dancing sessions near Edinburgh Castle. And the book suggests that you attend the Bolshoi ballet in Moscow and sample the beers at the Munich Oktoberfest. 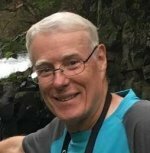 But to its credit, it puts a new spin on these activities; the writers have diligently sought out the places and events where the locals go for their shopping, dining, and entertainment. Here are a few gems I uncovered while reading Where the Locals Go, that brought back fond memories from my travels. • Attending evening classical music concerts in Prague’s churches and cathedrals. • Watching the King’s Day (Koningsdag) celebrations in Amsterdam. (I’ve been caught in the thick of the Amsterdam version, and was stunned at the non-stop Dutch revelry. It’s highly amused watching Nederlanders—all wearing orange—letting their hair down . . . big time). • Having a Dim Sum meal in Hong Kong, at 1 o’clock in the morning. (I’ll always remember the never-ending stream of exotic and delicious food that our Hong Kong friends insisted on plying us with). • Watching the locals practicing Tai Chi in Beijing’s parks, early in the morning. • Slurping Pho in tiny, bustling, dimly lit Saigon and Hanoi eateries with the locals. • Having glorious foot massages in Kuala Lumpur (for a few dollars!). • Watching the Symphony Orchestra play in Singapore’s gorgeous, lush Botanical Gardens as the tropical sun slips over the horizon in a red and orange blaze of glory. • Eating steamed meat so tender that it falls apart in your hands at ceremonial Maori Hangis in New Zealand. • Stretching out in the natural hot water pools on the sandy beach at New Zealand’s Coromandel Peninsula. • Gobbling up dozens of soft meaty mussels soaked in garlic and white wine sauce, and chowing down on hot, delicious, twice-fried frites (fries) in Brussels. 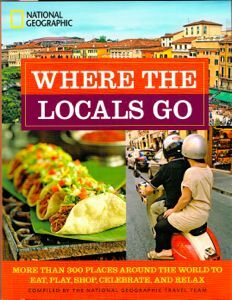 I highly recommend Where the Locals Go for travel writers who are searching for interesting and unusual story angles about local haunts, open-air markets, unusual festivals and events, and restaurants. Likewise, armchair travelers will enjoy the indulgent pleasures crowded onto its pages.